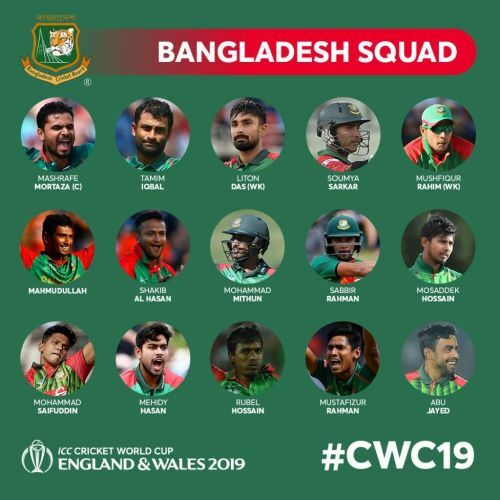 Bangladesh have announced their squad for the 2019 World Cup to be held in England and Wales. Mashrafe Mortaza has been named the captain, while all-rounder Shakib Al Hasan will don the role of vice-captain. As always, there have been a few surprises with regards to the team's selection policy. Middle-order batsman Mosaddek Hossain and fast-bowler Abu Jayed have been included in the squad which comes as quite a surprise. Mosaddek Hossain will make a return to the squad after previously featuring for Bangladesh in Asia Cup 2018. Abu Jayed, on the other hand, has made the cut following his exploits with the ball against New Zealand last month. The most shocking exclusions from the squad are those of Imrul Kayes and Taskin Ahmed. Imrul Kayes has played 78 ODIs for the nation and has fared reasonably well, boasting an average of 32. Bangladesh's core looks strong and they will rely heavily on experienced campaigners like Mashrafe Mortaza, Tamim Iqbal, Mahmudullah, Mushfiqur Rahim and Shakib Al Hasan. Tamim Iqbal and Liton Das will be expected to open the innings for the Bangla Tigers and get them off to quick starts. Their strong middle-order will consist of the likes of Mushfiqur Rahim, Mahmudullah and Shakib Al Hasan. Their pace attack also looks potent, with Mustafizur Rahman and Rubel Hossain in its ranks. Bangladesh will kick-start their World Cup campaign against South Africa at the Kennington Oval on June 2. Prior to that, they will play two practice matches against Pakistan and India, on May 26 and 28 respectively. Having ticked all the boxes, Bangladesh will look to win their maiden World Cup title. Mashrafe Mortaza (C), Tamim Iqbal, Mahmudullah, Mushfiqur Rahim, Shakib Al Hasan (VC), Soumya Sarkar, Liton Das, Sabbir Rahman, Mehidy Hasan, Mohammad Mithun, Rubel Hossain, Mustafizur Rahman, Mohammad Saifuddin, Mosaddek Hossain, Abu Jayed.